Under the artistic direction of Teri Brown, OnStage Productions has provided a welcome temporary home to peripatetic theater companies, opening their doors to InnerMission Productions and Pickwick Players in the past. Now, OnStage is hosting Turning Tydes Theatre Company, a small local troupe best known for its wacky musical mashups at the San Diego Fringe Festival (e.g., “Les Midge,” a nutty combo of “Les Miz” and “The Hobbit”; “Phantom of the Empire”; and “Wicked Wizards: A Potter Parody”). 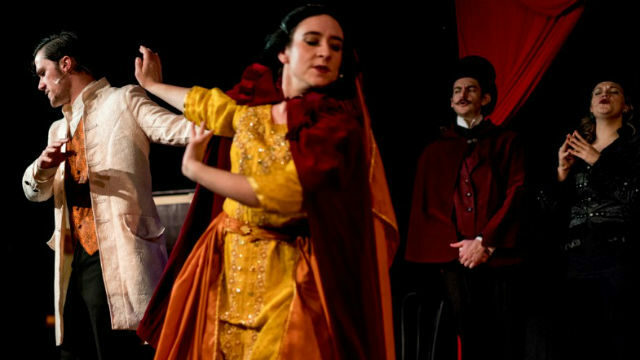 For this joint venture, “The Mystery of Edwin Drood,” with its loose-limbed, English music hall sensibility and audience participation, is a perfect fit for these formidable singers and improvisers. The musical, which won five Tony Awards, including Best Book, Best Original Score and Best Musical in 1986, was inspired by Charles Dickens’ final, unfinished novel of the same name. The episodic installments of the story (which is how most of Dickens’ work first reached the public) began in 1870, but were left in the lurch when the beloved author died of a sudden stroke that same year, at age 58. So, the mystery was ripe for inventive resolution, and songwriter Rupert Holmes (who wrote and recorded the no. 1 hit “Escape (The Piña Colada Song” in 1979), was just the man for the musical undertaking. He was that rare creative force who contributed the book, music, lyrics and full orchestrations of the show. From Dickens, he borrowed the central plot and most of the featured characters, and from the music hall and pantomime traditions, he adopted the bawdy humor and broad comic style. In a metatheatrical structural conceit, he devised a “show within a show.” The cast members are part of a vaudeville-type company at The Music Hall Royale, performing as Dickens’ characters, with the addition of juggling, backbending and other assorted skills. “Panto” practices allowed for a female to play the male Master of Ceremonies (here called The Chairman). Most inventively, Holmes lets the audience finish the story. They determine the outcome of the play by voting for an ending. They weigh in to ascertain who killed Drood (if he was killed at all), and the identity of the enigmatic inspector, and which two characters will become romantically involved in the final moments, so they can sing a love song and provide a happy ending. All this requires quite a bit of verbal and interpersonal agility, and this compelling cast of 18 has all the wherewithal required. The terrific, tongue-tying “Both Sides of the Coin” number is masterfully handled by the Chairman (first-rate Georgia Ladd) and the villainous John Jasper (wonderfully moustache-twirling, eyebrow-raising Tyler C. Jiles). Other notable performers: Turning Tydes co-founder Summer Blinco and her stunning soprano as Rosa Bud; Jordan Hall Campbell as the title character; Kat Fitzpatrick as the raunchy madame, The Princess Puffer; and Kaitlyn Summers as the Ceylonese twin, Helena Landless. Director Alex Bezdeka and choreographer Candace Carbajal keep the action spry (imaginative movement in a cast where not everyone is a dancer), though there are a few sluggish moments, and a tendency to line up the cast in a row at the lip of the stage. Musical director Jordan Hall Campbell did a fine job with the vocals (excellent harmonies throughout), but the accompaniment feels at a far remove when it’s not live. With everyone performing multiple tasks, and likely minimal resources, originality and creativity were on display in the set design (Bezdeka and Campbell) and costumes (Blinco and Andrea Pulliam). Heaps of archness, silliness and linguistic cleverness here, in equal measure. It’s a rollicking good time.